Merry Christmas and Day Three Hundred!!! I love that day 300 falls on Christmas. What an amazing day with my family. Tiring, but I wouldn’t trade it for the world. Lots of food, wine, presents, hugs, talking and laughs. I am so grateful for everything I have. Is it a cop out to say my good deed of the day was spending time with my family and giving presents? 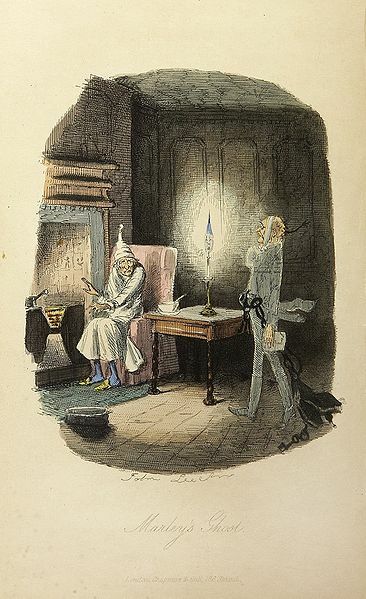 One of the most classic Christmas stories is Charles Dickens’ A Christmas Carol and the story of Scrooge. For those of you who live in a cave and don’t know, Ebenezer Scrooge is a greedy miser who hates Christmas, meets three Ghosts of Christmas (the Ghost of Christmas Past, the Ghost of Christmas Present, and the Ghost of Christmas Yet to Come) overnight, and finds redemption and happiness in good deeds. A great story of someone who finds out how much love, generosity, and kindness brings joy to their life. An interesting tidbit of information about the origins of Scrooge: Charles Dickens took the name off a gravestone in Edinburgh, Scotland. He was killing time before a lecture and came across the memorial slab reading “Ebenezer Lennox Scroggie – meal man”, referring to his job as a corn merchant. Through a mix of the failing light, poor eyesight and mild dyslexia, Dickens thought the stone read “mean man”. It must have “shrivelled” Scroggie’s soul, said Dickens, to carry “such a terrible thing to eternity”. (scotsman.com) These were the roots that started the character of Scrooge in Dickens’ brain. I hope everyone had a Merry Christmas. And for those of you who don’t celebrate Christmas, I hope you had a wonderful day! This entry was posted in 10 DECEMBER - Good Deed a Day and tagged Christmas, good deed, Scrooge by lschwietz. Bookmark the permalink.